Bickerstaff brainstem encephalitis (BBE) is a rare post-infectious neurological syndrome for which an effective treatment strategy has not been established. Here, we report a case of a 71-year-old male who suffered from an upper respiratory tract infection, and 7 days later, developed numbness of the bilateral upper and lower limbs, unsteady gait and dysarthria. Brain magnetic resonance imaging was normal, nerve conduction study and cerebral spinal fluid analysis were nonspecific. Based on the clinical features, we tentatively diagnosed Guillain-Barré syndrome and started immunoadsorption plasmapheresis. However, consciousness progressively declined to coma level within 10 days. 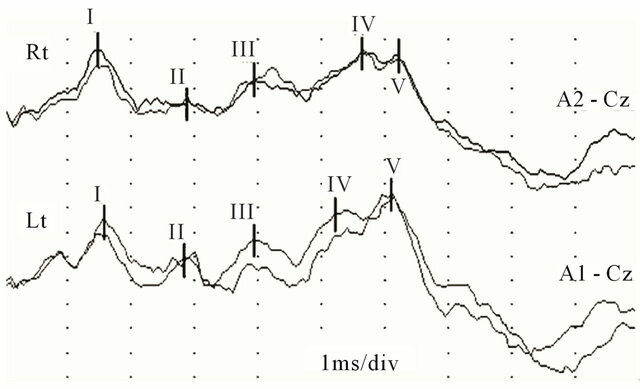 Electroencephalogram showed diffuse slowing, and auditory evoked brainstem response (ABR) demonstrated absence of waves II, III and V. Serum anti-GQ1b IgG autoantibody and anti-GM1b IgG autoantibody were negative. Subsequently, we diagnosed BBE, and clinical symptoms resolved after treatment with intravenous immunoglobulin and methyllprednisolone. On day 62, neurological symptoms were remarkably alleviated with an improvement in ABR. Our observations suggest that immunoadsorption plasmapheresis should be used only when antiganglioside antibodies are detected. Combination therapy with intravenous immunoglobulin and methylprednisolone or plasma exchange is recommended as initial therapy. Bickerstaff brainstem encephalitis (BBE), first described in 1951, is a rare post-infectious neurological syndrome characterized by ophthalmoplegia, ataxia and symptoms suggesting central nervous system involvement, such as impaired consciousness, extensor plantar responses and hemisensory loss . BBE shares common features with Miller Fisher syndrome (MFS), both clinically and immunologically, and accumulating evidence suggests that BBE and MFS are part of a continuous spectrum of variable central and peripheral nervous system involvement . However, the nosological relationship of BBE to MFS or Guillain-Barré syndrome (GBS) remains controversial, and effective therapy for BBE has yet to be established. Various treatments have been reported for BBE, such as 1) a combination of steroids and plasma exchange, 2) various types of plasmapheresis without steroids, 3) steroids only, 4) a combination of steroids and intravenous immunoglobulin (IVIg) and plasma exchange, and 5) nonspecific immunotherapy . In this report, we describe a patient with anti-GQ1b antibodynegative BBE who was successfully treated with IVIg and methylprednisolone. A 71-year-old man noticed numbness of both lower limbs 10 days after an upper respiratory tract infection. Within the next two days, he developed numbness of both upper limbs and was unable to walk without assistance. He was admitted to our hospital 2 weeks later because of a progression of motor and sensory disturbances and dyspnea. On admission, consciousness was lucid and eye movement was normal, but bilateral peripheral facial nerve palsy and dysarthria were observed. Using manual muscle testing (MMT), trace contraction was not demonstrated in the upper or lower limbs (MMT 0), and gloveand-stocking type hypoesthesia was observed. Deep tendon reflexes were hyporeflexic, jaw reflex was negative, and Babinski’s sign was not observed. His relatives reported neither toxin intake nor alcohol or drug consumption. As past history, he was diagnosed with atrial fibrillation 10 years earlier. Blood pressure was 125/82 mmHg and heart rate was 70/min. 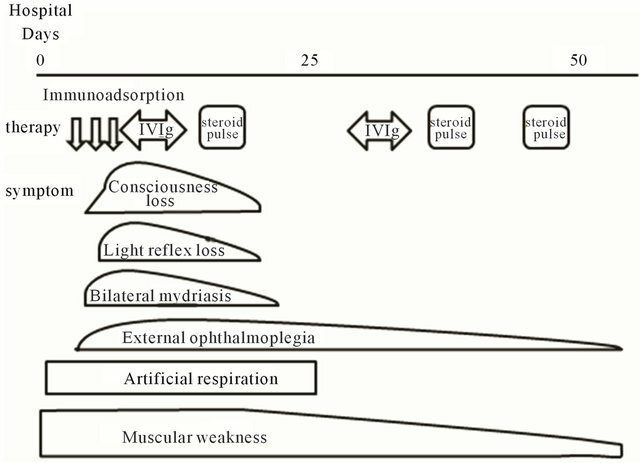 Hematological, hepatic, renal and heart function parameters were normal. He was intubated and placed on a ventilator because of respiratory failure. Lumbar puncture, performed on day 1, yielded clear cerebral spinal fluid (CSF), with zero white blood cells, 83 mg/dl of protein (normal value < 45 mg/dl) and 84 mg/dl of glucose. Oligoclonal banding was negative in CSF. Brain magnetic resonance imaging (MRI) was normal. We diagnosed the patient as having GBS, and three sessions of IAPP were performed on days 1, 3 and 6. IAPP therapy was conducted using a tryptophan-immobilized column (TR-350; Asahi Medical Co., Tokyo). Tests for IgG antibodies against GQ1b, GM1, GM2, GD1a and GD1b, measured by enzyme-linked immunosorbent assay (ELISA), were negative. Blood and CSF cultures were negative, and serological tests for cytomegalovirus, Epstein-Barr virus and herpes simplex virus were negative. Nerve conduction study on day 3 showed normal CMAP amplitudes with delayed motor and sensory conduction velocities in the median, ulnar, sural and tibial nerves. Distal median sensory nerve conduction velocities were not measurable. Figure 1. Clinical course. Immunoadsorption: immunoadsorption therapy using the tryptophan-immobilized polyvinyl alcohol gel column (IM-TR 350); IVIg: Venilon-I 0.4 g/kg × 5 days; Steroid pulse: methylprednisolone 1000 mg/day. 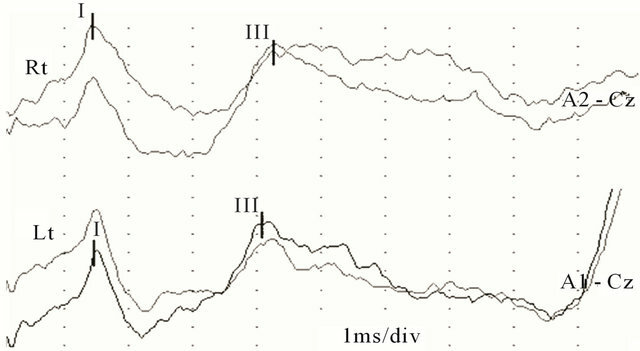 sence of II, III and V waves on both sides on day 7 (Figure 2). Ultimately, we diagnosed the patient as having BBE. On day 8, human IVIg infusion, 0.4 g/kg daily for 5 days, was started. Consciousness gradually recovered, and the pupillary light reflex returned to normal. On day 15, methylprednisolone infusion, 1 g/daily, was started for three days. Subsequently, respiratory failure began to recover, but tracheostomy was performed because he was still comatose. After IVIg and methylprednisolone treatment, respiratory failure gradually improved to normal breathing without a respirator on day 30. Based on his clinical improvement, IVIg and methylprednisolone treatment appeared very effective. In total, we performed one IVIg session and two sessions of methylprednisolone treatment. On day 62, his ABR showed remarkable improvement (Figure 3). On day 70, he had no neurological deficits apart from mild motor weakness (MMT 3 in both arms and MMT 4 in both legs) and was transferred to a rehabilitation hospital. Figure 2. ABR on day 7. ABR showed the absence of II, III and V waves on both sides. Figure 3. ABR on day 60. ABR showed remarkable improvement. of this patient were consistent with BBE. The relatively low prevalence of BBE prevents randomized clinical trials for the determination of effective therapy. At present, IVIg and plasmapheresis (IAPP, double filtration plasmapheresis and PE) are the main treatments for BBE, as for GBS and MFS . Several reports have suggested that plasma exchange and IVIg are benefical for BBE . In GBS, there is a consensus that both IVIg and plasma exchange are effective [3,7]. However, a large amount of fresh plasma is needed in plasma exchange therapy, and there is a potential risk of infection and allergy. IAPP is designed to selectively remove the immunoglobulin fraction instead of whole plasma. IAPP has been put forward as an effective treatment for GBS . Treatment with IAPP using a tryptophan-immobilized column was introduced for patients with GBS to remove antibodies to gangliosides. Because we initially diagnosed this patient as having GBS, we commenced IAPP treatment, but his symptoms progressively worsened. The efficacy of IAPP for the treatment of BBE remains controversial. Antibodies to gangliosides can be selectively removed using a tryptophan-immobilized column. However, serum antibodies to gangliosides (anti-GQ1b or anti-GT1a IgG) are undetectable in 33% of BBE patients , suggesting that IAPP may not be effective for anti-ganglioside antibody-negative BBE. Accumulating evidence suggests that combination therapy with IVIg and high-dose methylprednisolone is more effective than IVIg alone in patients with GBS . If we accept the premise that BBE, GBS and MFS form part of a continuous pathological spectrum with variable central and peripheral nervous system involvement, it might be reasonable to initiate IVIg and methylprednisolone combination therapy for BBE, particularly as BBE may represent the severe end of this spectrum. Combination therapy with IVIg and methylprednisolone is now recommended for patients with BBE by Japanese guidelines . However, randomized controlled trials have not yet been performed, and further studies are necessary to establish a standard treatment for BBE. The mechanisms underlying the efficacy of IVIg in demyelinating disease, such as GBS and BBE, is unclear. The results of two early trials on GBS [11,12] showed no benefit of treatment with low or high-dose prednisolone. Although several mechanisms have been proposed for the beneficial effects of steroids for demyelinating diseases, including the inhibition of inflammatory reactions and decreasing endoneurial pressure and edema, the exact mechanism is unknown [13-15]. IVIg therapy for BBE negative for anti-ganglioside antibodies has been reported by several authors, but the effects varied [16,17]. As a first line treatment for antibody-positive BBE, Tagawa et al. recommended plasma exchange rather than IAPP, because the ability of IAPP to remove anti-ganglioside IgGs and IgMs is inferior to that of plasma exchange . To the best of our knowledge, there is no information on the difference in efficacy of combination therapy for BBE patients with antiganglioside antibodies versus those without. It is reasonable to recommend combination therapy with IVIg and prednisolone or plasma exchange for BBE patients with unknown target antibodies. IAPP should be considered only when anti-ganglioside antibodies are detected. Further studies are necessary to establish a treatment for antiganglioside antibody-negative BBE patients.